Pes planus is a condition in which the arch or instep of the foot collapses and comes in contact with the ground. In some individuals, this arch never develops while they are growing. Alternative names include pes planovalgus, flat feet, fallen arches, pronation of the feet. As children grow, their legs will experience developmental changes that can result in excess flattening of the arches with weight bearing. One example is genu valgum, or knock-knees, a usually normal, temporary condition in children at different stages of growth. A tight calf muscle or Achilles tendon can also contribute to a flat foot. Many children will experience tight calf muscles as they go through growth spurts. Conditions that are present at birth and are often diagnosed early include: metatarsus adductus, calcaneovalgus and congenital vertical talus. Tarsal coalitions are congenitally fused foot bones that cause a rigid flat foot often associated with painful muscle spasms. This type of flat foot is usually diagnosed later in childhood or in adulthood. Any condition that causes loose ligaments can result in a flat foot or lower-than-normal arch. Ligaments are bands of tissue that connect bones to each other and have an important role in giving form to foot arches. An example of a condition that causes loosening of ligaments is pregnancy, where normal hormonal changes relax the ligaments. Diseases that cause loose ligaments include Ehlers-Danlos syndrome, Marfan's syndrome and rheumatoid arthritis. If one leg is longer than the other, one foot may be flat in relation to the other to compensate. Usually the foot on the longer limb will have a flatter arch in an effort to shorten that limb, balancing-out the unevenness. Leg length inequality can be caused by spinal abnormalities such as scoliosis. It can also be due to an actual difference in length of one leg bone compared to the other. Most people do not exhibit any symptoms of flat feet, but if the condition is due to an underlying problem, symptoms can include foot pain, mainly in the arch or heel areas, difficulty standing on tiptoes, swelling that occurs on the inside of the ankle, pain in the calf, knee, hip, or lower leg area, both feet lie flat on the ground with no gap, Shoes may not fit properly, heel may tilt away from the midline of the body more than usual, absence of foot arch when standing. If you are experiencing these symptoms and have flat feet, you should consider seeing your doctor or a podiatrist immediately for an examination. Your doctor examines your feet to determine two things, whether you have flat feet and the cause or causes. An exam may include the following steps, Checking your health history for evidence of illnesses or injuries that could be linked to flat feet or fallen arches, Looking at the soles of your shoes for unusual wear patterns, Observing the feet and legs as you stand and do simple movements, such as raising up on your toes, Testing the strength of muscles and tendons, including other tendons in the feet and legs, such as the Achilles tendon or the posterior tibial tendon, Taking X-rays or an MRI of your feet. There are different modalities of treatment that are available to manage flat feet and fallen arches. The type of treatment that is chosen depends upon how severe the condition is and what symptoms the patients are experiencing. Below is a brief description of the available treatment modalities. In the event that the patient is experiencing swelling of the feet, rest and ice application is usually the initial treatment step. Oral anti-inflammatories may be offered which can help reduce inflammation as well as associated pain. Physical therapy has good outcomes and can include different exercises such as stretches and strengthening of the surrounding muscles. Changes in footwear and activity modification are also important when dealing with a painful flat (pronated) foot. These days, orthotic insoles are easily available either over the counter or through your Podiatrist which can effectively help maintain the arch of the foot and reduce the amount of stress placed on the foot. Podiatrists are able to prescribe a variety of different devices from prefabricated to customized and are trained to determine the most appropriate device for each individual. In order to offer the right kind of orthotic insole, podiatrists may perform a test called gait analysis. This involves asking the patient to walk and videoing the different movements that the foot of forms during the walking. Features such as over pronation can be easily seen on this and orthotic insoles can be prescribed to correct the specific abnormalities that are picked up on this analysis. Overall, orthotic treatment can result in a significant improvement in foot movement and reduction in foot discomfort. A better approach is to strengthen the weakened ligaments with Prolotherapy, supplemented by an arch support if the condition has existed for several years. Chronic pain is most commonly due to tendon and ligament weakness, or cartilage deterioration. The safest and most effective natural medicine treatment for repairing tendon, ligament and cartilage damage is Prolotherapy. In simple terms, Prolotherapy stimulates the body to repair painful areas. It does so by inducing a mild inflammatory reaction in the weakened ligaments and cartilage. Since the body heals by inflammation, Prolotherapy stimulates healing. Prolotherapy offers the most curative results in treating chronic pain. It effectively eliminates pain because it attacks the source: the fibro-osseous junction, an area rich in sensory nerves. What?s more, the tissue strengthening and pain relief stimulated by Prolotherapy is permanent. Heel pain is a very common foot problem. The sufferer usually feels pain either under the heel (planter fasciitis) or just behind it (Achilles tendinitis), where the Achilles tendon connects to the heel bone. Even though heel pain can be severe and sometimes disabling, it is rarely a health threat. Heel pain is typically mild and usually disappears on its own; however, in some cases the pain may persist and become chronic (long-term). There are 26 bones in the human foot, of which the heel (calcaneus) is the largest. The human heel is designed to provide a rigid support for the weight of the body. When we are walking or running it absorbs the impact of the foot when it hits the ground, and springs us forward into our next stride. Experts say that the stress placed on a foot when walking may be 1.25 times our body weight, and 2.75 times when running. Consequently, the heel is vulnerable to damage, and ultimately pain. One of the most common heel pain causes is a condition called plantar fasciitis. The tendons, ligaments, muscles, and joints in the feet all work together to allow you to move your feet to walk or run. When the plantar fascia, or the arch of the foot, is overused or injured, pain is felt in the heel. The most common heel pain causes include plantar fasciitis, Achilles tendonitis, Bursitis, Fibromyalgia, Bone fracture, Heel spurs, Arthritis, Tarsal tunnel syndrome, Sever?s Disease. Common symptoms, heel Spurs: the pain is usually worst on standing, particularly first thing in the morning when you get up. It is relatively common, though usually occurring in the over forty's age group. There are no visible features on the heel but a deep localised painful spot can be found in or around the middle of the sole of the heel. Although it is often associated with a spur of bone sticking out of the heel bone (heel spur syndrome), approximately ten per cent of the population have heel spurs without any pain. Heel Bursitis, pain can be felt at the back of the heel when the ankle joint is moved and there may be a swelling on both sides of the Achilles tendon. Or you may feel pain deep inside the heel when it makes contact with the ground. Heel Bumps, recognised as firm bumps on the back of the heel , they are often rubbed by shoes causing pain. A podiatrist (doctor who specializes in the evaluation and treatment of foot diseases) will carry out a physical examination, and ask pertinent questions about the pain. The doctor will also ask the patient how much walking and standing the patient does, what type of footwear is worn, and details of the his/her medical history. Often this is enough to make a diagnosis. Sometimes further diagnostic tests are needed, such as blood tests and imaging scans. Most heel pain is caused by a combination of poor biomechanics, or muscle weakness or tightness. The good news is that heel pain can be effectively managed once the cause is identified. Most heel pain can be successfully treated via pain and pressure relief techniques, biomechanical correction eg orthotics, taping, foot posture exercises, muscle stretches and massage, lower limb muscle strengthening, proprioceptive and balance exercises to stimulate your foot intrinsic muscles. If you feel that your footwear or sports training schedule are potentially causing your heel pain, then we recommend that you seek the advice of a sports physiotherapist, podiatrist or trained footwear specialist (not just a shop assistant) to see if your shoe is a match for your foot; or discuss your training regime to see if you are doing too much. Heel pain and injury are extremely common. With accurate assessment and early treatment most heel pain injuries respond extremely quickly to physiotherapy allowing you to quickly resume pain-free and normal activities of daily living. Please ask you physiotherapist for their professional treatment advice. Surgery to correct heel pain is generally only recommended if orthotic treatment has failed. There are some exceptions to this course of treatment and it is up to you and your doctor to determine the most appropriate course of treatment. Following surgical treatment to correct heel pain the patient will generally have to continue the use of orthotics. The surgery does not correct the cause of the heel pain. The surgery will eliminate the pain but the process that caused the pain will continue without the use of orthotics. If orthotics have been prescribed prior to surgery they generally do not have to be remade. Approximately 75% of us present with one leg longer than the other. It?s staggering, literally, that so many people walk about with an imbalance. Yet to have one leg longer than the other doesn?t seem to create pain for everyone but for those that it does it brings pain in a myriad of dysfunction from TMJ, headaches, low back pain, IBS, bladder problems, sexual dysfunction, sacroiliac joint pain, pubis dysfunction, groin strain, gluteal dysfunction as well as the formation of trigger points. Children whose limbs vary in length often experience difficulty using their arms or legs. They might have difficulty walking or using both arms to engage in everyday activities. A doctor will generally take a detailed medical history of both the patient and family, including asking about recent injuries or illnesses. He or she will carefully examine the patient, observing how he or she moves and stands. 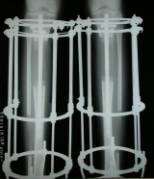 If necessary, an orthopedic surgeon will order X-ray, bone age determinations and computed tomography (CT) scans or magnetic resonance imaging (MRI). The non-surgical intervention is mainly usedfor the functional and environmental types of leg length discrepancies. It is also applied to the mild category of limb length inequality. Non-surgical intervention consists of stretching the muscles of the lower extremity. This is individually different, whereby the M. Tensor Fascia latae, the adductors, the hamstring muscles, M. piriformis and M. Iliopsoas are stretched. In this non-surgical intervention belongs also the use of shoe lifts. These shoe lifts consists of either a shoe insert (up to 10-20mm of correction), or building up the sole of the shoe on the shorter leg (up to 30-60mm of correction). This lift therapy should be implemented gradually in small increments. Several studies have examined the treatment of low back pain patients with LLD with shoe lifts. Gofton obtained good results: the patients experienced major or complete pain relief that lasted upon follow-up ranging from 3 to 11 years. Helliwell also observed patients whereby 44% experienced complete pain relief, and 45% had moderate or substantial pain relief. Friberg found that 157 (of 211) patients with LBP, treated with shoe lifts, were symprom-free after a mean follow-up of 18 months. Epiphysiodesis is a surgical option designed to slow down the growth of the long leg over a period of months to years. It is only used in growing children. The operation involves a general anaesthetic. Small incisions are made around the knee near the growth plates of the thigh bone and the shin bone. The growth plates are prevented from growing by the use of small screws and plates (?8 - plates?). The screws are buried beneath the skin and are not visible. Stitches are buried beneath the skin and do not need to be removed. The child is normally in hospital for 2-3 days. The child can weight bear immediately and return back to normal activity within a few weeks. Long term follow up is required to monitor the effects of the surgery. The timing of the surgery is based on the amount of growth predicted for the child. Therefore, this procedure can under- and over-correct the difference in leg length. Occasionally the screws have to be removed to allow growth to continue. This procedure can be used on one half of the growth plate to correct deformity in a limb e.g. knock-knees or bow legs. This is known as hemiepiphysiodesis. Morton's neuroma is a swollen, inflamed nerve in the foot.Morton's neuroma causes a "burning" sharp pain on the bottom of the foot. Treatments for Morton's neuroma include resting the foot, better-fitting shoes, anti-inflammation medications, ice packs, and operation. A neuroma is growth (benign tumor) that arises in nerve cells. A Morton's neuroma is a swollen, inflamed nerve located between the bones at the ball of the foot. The most common location of a Morton's neuroma is in either the second or the third spacing from the base of the big toe. Experts are not sure what exactly causes Morton's neuroma. It seems to develop as a result of irritation, pressure or injury to one of the digital nerves that lead to the toes, which triggers a body response, resulting in thickened nerve tissue (neuroma). Feet conditions/situations that can cause the bones to rub against a nerve include high-heeled shoes, especially those over 2 inches (5cm), or a pointed or tight toe box which squash the toes together. This is probably why the condition is much more common in females than in males. High-arched foot, people whose feet have high arches are much more likely to suffer from Morton's neuroma than others. Flat feet, the arch of the foot collapses. The entire sole of the foot comes into complete or near-complete contact with the ground. A bunion, a localized painful swelling at the base of the big toe, which enlarges the joint. Hammer toe, a deformity of the proximal interphalangeal joint of the second, third, or fourth toe causing it to be permanently bent. Some high-impact sporting activities including running, karate, and court sports. Any sport that places undue pressure on the feet. Injuries, an injury or other type of trauma to the foot may lead to a neuroma. If you have a Morton's neuroma, you will probably have one or more of these symptoms. Tingling, burning, or numbness. A feeling that something is inside the ball of the foot, or your sock is bunched up. Pain that is relieved by removing your shoes. A Morton's Neuroma often develops gradually. At first the symptoms may occur only occasionally, when wearing narrower shoes or performing certain activities. The symptoms may go away temporarily by massaging the foot or by avoiding aggravating shoes or activities. Over time the symptoms progressively worsen and may persist for several days or weeks. The symptoms become more intense as the neuroma enlarges and the temporary changes in the nerve become permanent. Treatments may include rehabilitation measures to reduce nerve Irritation. Switching to low-heeled, wide-toed shoes with good arch support. Wearing padding in the shoes and/or between the toes. Wearing shoe inserts to correct a mechanical abnormality of the foot. Having ultrasound, electrical stimulation, whirlpool, and massage done on the foot. The foot may be injected with corticosteroids mixed with a local anesthetic in order to reduce pain. Relief may be only temporary, however, if the mechanical irritation is not also corrected. Injections with other types of medications such as alcohol, phenol, or vitamin B12 are sometimes used. Surgery may be considered in patients who have not responded adequately to non-surgical treatments. Your foot and ankle surgeon will determine the approach that is best for your condition. The length of the recovery period will vary, depending on the procedure performed. Regardless of whether you?ve undergone surgical or nonsurgical treatment, your surgeon will recommend long-term measures to help keep your symptoms from returning. These include appropriate footwear and modification of activities to reduce the repetitive pressure on the foot. Although the exact causes of neuromas are not completely known, the following preventive steps may help. Make sure your exercise shoes have enough room in the front part of the shoe and that your toes are not excessively compressed. Wear shoes with adequate padding in the ball of the foot. Avoid prolonged time in shoes with a narrow toe box or excessive heel height (greater than two inches). A Hammertoe can be flexible or rigid. Hammertoes often start out flexible and become rigid over time as your toe becomes accustomed to its crooked position. Flexible hammertoes are less serious than rigid hammertoes, as they can be easily diagnosed and treated in their initial stages. Flexible hammertoes are named as such because your affected toe still possesses some degree of movement. Hammer, claw, and mallet toes can cause discomfort and pain and may make it hard to walk. Shoes may rub on your toes, causing pain, blisters, calluses or corns, or sores. Sores can become infected and lead to cellulitis or osteomyelitis, especially if you have diabetes or peripheral arterial disease. If you have one of these health problems and sores develop, contact your doctor. A hammertoe is usually diagnosed with a physical inspection of your toe. Imaging tests, such as X-rays, may be ordered if you have had a bone, muscle, or ligament injury in your toe. Non-surgical methods for hammer toes (claw toes) are aimed at decreasing symptoms (i.e., pain and/or calluses) and/or limiting the progression into a larger problem. Simple treatments patients can do are wear supportive shoes. Use an arch support. Wear shoes with a wide toe box. Modify activities. Spot stretch shoes. Periodic callus care. The best ways to prevent a hammertoe are. Wear shoes that fit well. Shoes should be one-half inch longer than your longest toe. Shoes should be wide enough and the toe box should be high enough to give the foot room to move. Don?t wear shoes with heels over 2 inches high. If a toe starts to look like a hammertoe, buy shoes that have an extra high toe box. Wear corn pad removers or cushion pads on top of the affected toe. See your healthcare provider any time you have foot pain that does not go away quickly or is more than mild pain. Foot pain is not normal. A bunion is an enlargement at the base of the big toe caused by a misalignment of the joint. Hallux valgus or hallux abducto valgus (HAV) is the name used for the deviated position. of the big toe and a bunion refers to the enlargement of the joint, most of the time the two go together and can just be referred to as ?bunions?. Bunions are really only a symptom of faulty foot mechanics and are usually caused by the foot we inherit and inappropriate footwear use. As the big toe bends towards the others this lump becomes larger and the bunion can become painful - arthritis and stiffness can eventually develop. The classic bunion, medically known as hallux abductovalgus or HAV, is a bump on the side of the great toe joint. This bump represents an actual deviation of the 1st metatarsal and often an overgrowth of bone on the metatarsal head. In addition, there is also deviation of the great toe toward the second toe. In severe cases, the great toe can either lie above or below the second toe. Shoes are often blamed for creating these problems. This, however, is inaccurate. It has been noted that primitive tribes where going barefoot is the norm will also develop bunions. Bunions develop from abnormal foot structure and mechanics (e.g. excessive pronation), which place an undue load on the 1st metatarsal. This leads to stretching of supporting soft tissue structures such as joint capsules and ligaments with the end result being gradual deviation of the 1st metatarsal. As the deformity increases, there is an abnormal pull of certain tendons, which leads to the drifting of the great toe toward the 2nd toe. At this stage, there is also adaptation of the joint itself that occurs. A bony bump along the edge of the foot, at the base of the big toe (adjacent to the ball of the foot) Redness and some swelling at or near the big toe joint. Deep dull pain in the big toe joint. Dull achy pain in the big toe joint after walking or a sharp pain while walking. The big toe is overlapping the second toe, resulting in redness, calluses, or other irritations such as corns. Bunions are readily apparent, you can see the prominence at the base of the big toe or side of the foot. However, to fully evaluate your condition, the Podiatrist may arrange for x-rays to be taken to determine the degree of the deformity and assess the changes that have occurred. Because bunions are progressive, they don't go away, and will usually get worse over time. But not all cases are alike, some bunions progress more rapidly than others. There is no clear-cut way to predict how fast a bunion will get worse. The severity of the bunion and the symptoms you have will help determine what treatment is recommended for you. Bunions often respond to conservative care measures and should always be treated by a qualified healthcare professional in a timely and appropriate manner. Conservative treatment for bunions usually involves the following, splinting your great toe (so that it does not migrate toward the inside edge of your foot). A toe-spacer (such as Correct Toes) may be a useful tool, because it helps progressively splay and re-align all of your toes. Performing range of motion exercises (to move your big toe into a more favorable position). Supporting of the joints in the back of your foot that cause forefoot instability. Using shoes that allow the bunion splint to keep your big toe pointing straight ahead. There are many different surgical procedures that can be performed. The decision to perform one type of surgery or another is based upon the extent and magnitude of the bunion deformity, the presence of arthritis in the big toe joint, and the space between the first and second metatarsals, which is called the intermetatarsal angle. It is very rare that a bunion can be treated by simply shaving down the bump of the bone. Invariably, the deformity will recur and both the bunion and the hallux valgus will return. Therefore, the shaving of the bunion, called an exostectomy, is performed in conjunction with a cut of the first metatarsal bone (which is called an osteotomy). Over-pronation refers to pronation occurring at the wrong time in the gait cycle. Just before the foot pushes off, it should become a rigid lever as the arch rises and the ankle straightens. If instead, the arch remains flattened and the ankle remains turned inward, muscles and tendons will be stressed and the foot will undergo excessive wear and tear. This can cause the foot bones to shift position, which results in additional stress of the bones and joints above the pronated foot. Over time, it is this stress that causes pain in the knees, ankles, feet and back. There may be several possible causes of over pronation. The condition may begin as early as birth. However, there are several more common explanations for the condition. First, wear and tear on the muscles throughout the foot, either from aging or repetitive strain, causes the muscles to weaken, thereby causing the foot to turn excessively inward. Also, standing or walking on high heels for an extended period of time also places strain and pressure on the foot which can weaken the tissue. Lastly, shoes play a very common factor in the development of over pronation. Shoes that fail to provide adequate support through the arch commonly lead to over pronation. People who overpronate have flat feet or collapsed arches. You can tell whether you overpronate by wetting your feet and standing on a dry, flat surface. If your footprint looks complete, you probably overpronate. Another way to determine whether you have this condition is to simply look at your feet when you stand. If there is no arch on the innermost part of your sole, and it touches the floor, you likely overpronate. The only way to truly know for sure, however, is to be properly diagnosed by a foot and ankle specialist. Pronation and supination are bio-mechanical problems, and are best treated and prevented with orthotic inserts. But before you run out to buy orthotics it makes sense to get the right advice on footwear, and the best advice I can give you, is to go and see a qualified podiatrist for a complete foot-strike and running gait analysis. They will be able to tell you if there are any concerns regarding the way your running gait is functioning. After your running gait has been analysed, have your podiatrist, or competent sports footwear sales person recommend a number of shoes that suit your requirements. Good quality footwear will go a long way in helping to prevent pronation and supination. And, if needed, invest in a pair of orthotic inserts to further prevent excessive pronation or supination. The MBA implant is small titanium device that is inserted surgically into a small opening between the bones in the hind-mid foot: the talus (ankle bone) and the calcaneus (heel bone). The implant was developed to help restore the arch by acting as a mechanical block that prevents the foot from rolling-in (pronation). In the medical literature, the success rate for relief of pain is about 65-70%. Unfortunately, about 40% of people require surgical removal of the implant due to pain. How You Can Diagnose Severs Disease? Sever?s disease (also known as calcaneal apophysitis) is a type of bone injury in which the growth plate in the lower back of the heel, where the Achilles tendon (the heel cord that attaches to the growth plate) attaches, becomes inflamed and causes pain. Sever?s disease is the most common cause of heel pain in children, especially those who exercise or play sports on a regular basis. Heel pain is very common in children due to the fact they are cnstantly growing. In most children, the heel bone (the calcaneus) is not fully developed until the age of 14 or older. Until then, new bone is forming at the growth plate of the foot (the apophysis, located at the back of the heel), an area which is softer than others due to its role in accommodating the growth. Repetitive stress on the growth plate due to walking, running and sports causes inflammation in the heel area. Because the heel's growth plate is sensitive, repeated running and pounding on hard surfaces can result in pediatric heel pain. Children and adolescents who take part in a lot of sport are especially vulnerable. Over-pronation (fallen arches and rolling inwards of the feet) will increase the impact on the growth plate and is therefore a significant cause and a major contributing factor to heel pain in children. The main symptom of sever's disease is pain and tenderness at the back of the heel which is made worse with physical activity. Tenderness will be felt especially if you press in or give the back of the heel a squeeze from the sides. There may be a lump over the painful area. Another sign is tight calf muscles resulting with reduced range of motion at the ankle. Pain may go away after a period of rest from sporting activities only to return when the young person goes back to training. All medical diagnosis should be made by taking a full history, examining the patient then performing investigations. The problem usually occurs in boys who are going through or have just gone through a growth spurt; one or both heels may be affected. Initially the pain may be intermittent occurring only during or after exercise. As the problem gets worse, pain may be present most of the time. There may be swelling over the back of the heel and this area is painful if touched or knocked. On examination the patient often has flat feet, very tight legs muscles especially the gastrocnemius. If the problem is bad enough, it is important to totally rest the symptomatic foot. Take a break from sport activity until the pain has significant improvement. Severe cases will need to be treated with a cast boot. Anti-inflammatory treatments include Icing, Over-the-counter anti-inflammatory medicine as recommended by your pediatrician or podiatrist. Shock absorption and support. Don't go barefoot at home, wear some type of good sandal or shoe. A significant and/or chronic case should be treated with prescription orthotics. This addresses mechanical problems that cause this problem, Using an over-the-counter heel cushion inside of the shoe, Athletic foot taping, Stretching. Runners stretch to stretch out the calf muscle. A night splint will also help. Severe or chronic cases respond best to prescription orthotics with specific modifications for this problem. May require a night splint. Daytime braces that may also help. The following exercises are commonly prescribed to patients with Severs disease. You should discuss the suitability of these exercises with your physiotherapist prior to beginning them. Generally, they should be performed 1 - 3 times daily and only provided they do not cause or increase symptoms. Your physiotherapist can advise when it is appropriate to begin the initial exercises and eventually progress to the intermediate, advanced and other exercises. As a general rule, addition of exercises or progression to more advanced exercises should take place provided there is no increase in symptoms. Calf Stretch with Towel. Begin this stretch in long sitting with your leg to be stretched in front of you. Your knee and back should be straight and a towel or rigid band placed around your foot as demonstrated. Using your foot, ankle and the towel, bring your toes towards your head as far as you can go without pain and provided you feel no more than a mild to moderate stretch in the back of your calf, Achilles tendon or leg. Hold for 5 seconds and repeat 10 times at a mild to moderate stretch provided the exercise is pain free. Calf Stretch with Towel. Begin this exercise with a resistance band around your foot and your foot and ankle held up towards your head. Slowly move your foot and ankle down against the resistance band as far as possible and comfortable without pain, tightening your calf muscle. Very slowly return back to the starting position. Repeat 10 - 20 times provided the exercise is pain free. Once you can perform 20 repetitions consistently without pain, the exercise can be progressed by gradually increasing the resistance of the band provided there is no increase in symptoms. Bridging. Begin this exercise lying on your back in the position demonstrated. Slowly lift your bottom pushing through your feet, until your knees, hips and shoulders are in a straight line. Tighten your bottom muscles (gluteals) as you do this. Hold for 2 seconds then slowly lower your bottom back down. Repeat 10 times provided the exercise is pain free. About two thirds of all Achilles tendon ruptures occur during sports. Total ruptures are most common in sports with stop-and-go movements, especially ball sports. The majority of patients suffered a ruptured Achilles tendon when stopping suddenly during a fast vigorous movement. Usually the Achilles tendon tears about 5 cm before it inserts into the heel bone. Particularly at risk for a tear are athletes who have already suffered from Achilles tendon problems for some time. The tendon is susceptible to injury and can rupture during vigorous activities such as running and jumping. Rupture can also occur as a result of gradual wear. After becoming chronically weakened, it can rupture during non-stress activities like walking. Many people say that a ruptured Achilles feels like ?being shot in the heel?, if you can imagine how enjoyable that feels. You may hear a snap sound or feel a sudden sharp pain when the tendon tears. After a few moments, the pain settles and the back of the lower leg aches. You can walk and bear weight, but you may find it difficult to point the foot downward or push off the ground on the affected side. You will be unable to stand on tiptoe. Bruising and swelling are likely, and persistent pain will be present. Similar symptoms may be caused by an inflamed Achilles tendon (Achilles tendonitis), a torn calf muscle, arthritis of the ankle, or deep vein thrombosis in the calf, so an MRI or ultrasound scan will likely be used to diagnose your condition. The actual area of an Achilles tendon rupture cannot be seen on x-ray. Therefore, although x-rays are often done to rule out bony injuries in individuals with an Achilles tendon rupture these x-rays are usually normal. Diagnostic ultrasound of the tendon can be performed to assess the integrity of the tendon. Other diagnostic tests, such as MRI's, may also be required in difficult cases. Two treatment options are casting or surgery. If an Achilles tendon rupture is untreated then it may not heal properly and could lead to loss of strength. Decisions about treatment options should be made on an individual basis. Non-surgical management traditionally is selected for minor ruptures, less active patients, and those with medical conditions that prevent them from undergoing surgery. The goal of casting is to allow the tendon to slowly heal over time. The foot and ankle are positioned to bring the torn ends of the tendon close together. Casting or bracing for up to 12 weeks or more may be necessary. This method can be effective and avoids some risks, such as infection, associated with surgery. However, the likelihood of re-rupture may be higher with a non-surgical approach and recovery can take longer. Thanks to a new surgical technique, operative procedures are often more beneficial.The operative treatment of Achilles tendon ruptures has significantly changed in recent years. The objective today is to connect the torn tendons using modern suture and possibly adhesive materials. Through small surgical incisions the ends of the torn tendon are surgically exposed, and sutures are used to tie the ends permanently together. Thus, the operated repaired tendon is again resilient within a reasonable time. The cast treatment and walking on crutches required in the past, is with this procedure usually not necessary. Instead, functional treatment following the surgery involves wearing a special boot, meaning that the patient can put weight onto the operated leg again within a few days after surgery. Physical therapy training will start immediately following the operation. The philosophy behind such an early functional treatment is that tissue adequately adapts to stress and thus accelerates the healing process. For the patient, the modern surgical treatment of an Achilles tendon rupture has the distinct advantage that no prolonged hospital stay is necessary. Hospital stay usually lasts only a few days. Using crutches, patients can return to work soon after the surgery. Good flexibility of the calf muscles plays an essential role in the prevention of Achilles tendon injuries. It is also important to include balance and stability work as part of the training programme. This should include work for the deep-seated abdominal muscles and for the muscles that control the hip. This might at first appear odd, given the fact that the Achilles are a good distance from these areas, but developing strength and control in this area (core stability) can boost control at the knee and ankle joints. Training errors should be avoided. The volume, intensity and frequency of training should be monitored carefully, and gradually progressed, particularly when introducing new modes of training to the programme. Abrupt changes in training load are the primary cause of Achilles tendinopathy. Lengthening is usually done by corticotomy and gradual distraction. This technique can result in lengthenings of 25% or more, but typically lengthening of 15%, or about 6 cm, is recommended. The limits of lengthening depend on patient tolerance, bony consolidation, maintenance of range of motion, and stability of the joints above and below the lengthened limb. Numerous fixation devices are available, such as the ring fixator with fine wires, monolateral fixator with half pins, or a hybrid frame. The choice of fixation device depends on the desired goal. A monolateral device is easier to apply and better tolerated by the patient. The disadvantages of monolateral fixation devices include the limitation of the degree of angular correction that can concurrently be obtained; the cantilever effect on the pins, which may result in angular deformity, especially when lengthening the femur in large patients; and the difficulty in making adjustments without placing new pins. Monolateral fixators appear to have a similar success rate as circular fixators, especially with more modest lengthenings (20%). LLDs are very common. Sometimes the cause isn?t known. But the known causes of LLD in children include, injury or infection that slows growth of one leg bone. Injury to the growth plate (a soft part of a long bone that allows the bone to grow). Growth plate injury can slow bone growth in that leg. Fracture to a leg bone that causes overgrowth of the bone as it heals. A congenital (present at birth) problem (one whole side of the child?s body may be larger than the other side). Conditions that affect muscles and nerves, such as polio. Often there are few or no symptoms prior to the age of 25-35. The most common symptom is chronic lower back pain, but also is frequently middle and upper back pain. Same-sided and repeated injury or pain to the hip, knee and/or ankle is also a hallmark of a long-standing untreated LLD. It is not uncommon to have buttock or radiating hip pain that is non-dermatomal (not from a disc) and tends to go away when lying down. Infants, children or adolescents suspected of having a limb-length condition should receive an evaluation at the first sign of difficulty in using their arms or legs. In many cases, signs are subtle and only noticeable in certain situations, such as when buying clothing or playing sports. Proper initial assessments by qualified pediatric orthopedic providers can reduce the likelihood of long-term complications and increase the likelihood that less invasive management will be effective. In most cases, very mild limb length discrepancies require no formal treatment at all.